Little is known of Muriel Slevin’s life. She was born ca. 1876, married November 30, 1929, and died December 10, 1965. 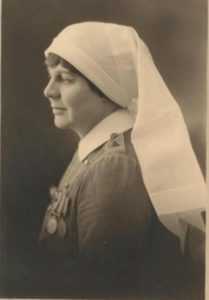 She served in World War I as a nursing sister, and later appears to have been active in community life in British Columbia. Fonds consists of a letter to her mother (June 7, 1915), some correspondence regarding the donation of materials, artifacts, and a photograph taken in 1919 or 1920. Of special note is a medal presented to Muriel Slevin by King George V at Buckingham Palace. A number of badges also appear to date from World War I.